The July meeting was held at the residence of Gary and Nadine Ures. President Elizabeth Good opened the meeting at 9:15 am. Quite a few members were in attendance. 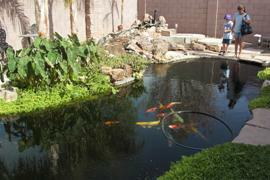 The Ures’ backyard had a relaxing atmosphere, with a large koi pond being the focal point. 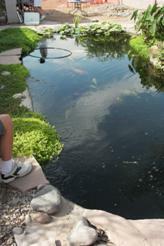 Their pond is oblong and 6’ deep at the ends and 5.5’ in the center. The Ures are still in the process of finishing a waterfall with a top pond. The speaker was Gary Ures. He presented a program on repairing liners, installing bulkheads and retrofitting a bottom drain. He made repairs look really simple! Many members availed themselves of the numerous free water plants brought by members and some small fish rescued by phoenixkoirescue.com. The September meeting will be held Saturday, September 8th at the home of Bill and Gay Reeves.